Introduction: Over the last few years, Single Incision Laparoscopic surgery (SILS) has gained considerable acceptance among surgeons as it aims to transform minimally invasive surgery and is widely being seen as a safe alternative to Natural Orifice Translumenal Endoscopic Surgery (NOTES). As with any novel technique, SILS also has a learning curve associated with it, which might be a crucial factor in its application. However, this has been documented in only a few studies so far. 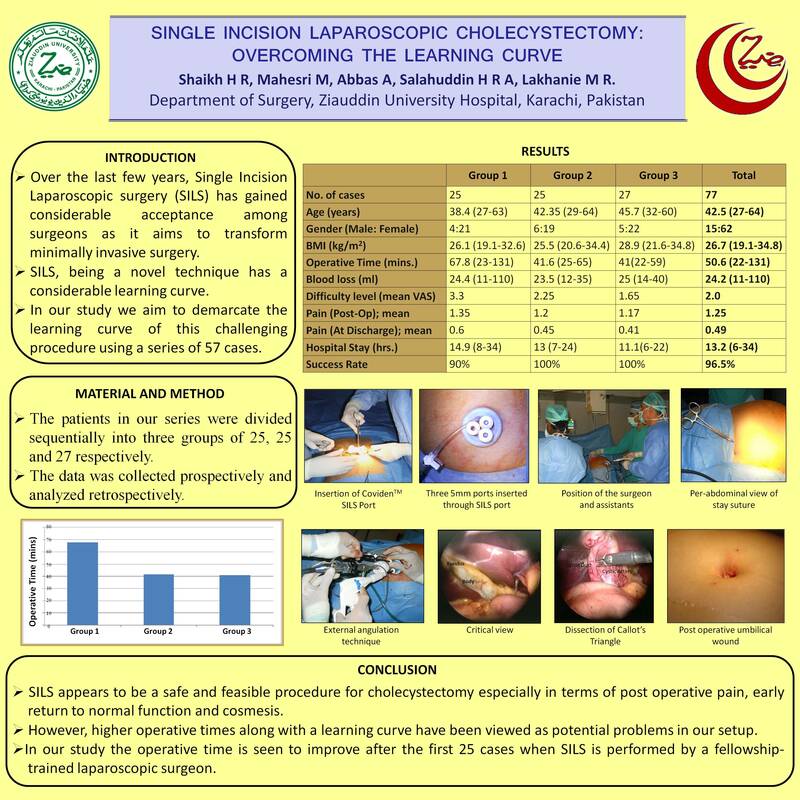 In our study we present our initial experience of 77 cases of Single Incision Laparoscopic cholecystectomy from Pakistan and aim to demarcate the learning curve of this challenging procedure. Material and Method: The study was conducted on 77 patients presenting to Ziauddin University Hospital with symptomatic gall bladder diseases who agreed to undergo cholecystectomy via SILS. All ethical requirements were kept under consideration and the patients were particularly informed about the novelty of this technique. The transumbilical route was employed using the Covidien SILSTM ports and Olympus TriPortTM by the same surgeon. Data recorded included patient demographics, operative time, length of stay, estimated blood loss, analgesia requirements, cosmesis and complications. Results: Seventy five of the 77 patients successfully underwent SILS cholecystectomy during the 1 year study period. Two patients required conversion to conventional four port Laparoscopic surgery because of difficult dissection. In our series, the male to female ratio was 14:63 with an average age of 42.5 yrs. (27-64 yrs.) and a mean BMI of 26.7 kg/m2 (19.1-34.8 kg/m2). The mean operative time was 50.6 minutes (22-131 mins) and the estimated blood loss was about 24.2 ml (11-110 ml). The mean hospital stay was 13.2 hrs (6-34 hrs). No post operative complications were reported in any of our patients. Patients were divided into three sequential groups with the first two groups comprising of 25 patients and the last having 27 patients. The operative times of each sequential group were compared. The operative time for the First group was considerably longer (mean=67.8 mins) than the second group (p<0.001). There was no significant difference between the second and third group as the operative time decreased coming to a steady constant. Conclusion: SILS appears to be a safe and feasible procedure for cholecystectomy especially in terms of post operative pain, early return to normal function and cosmesis. However, higher operative times along with a learning curve have been viewed as potential problems in our setup. In our study the operative time is seen to improve after the first 25 cases when SILS is performed by a fellowship-trained laparoscopic surgeon.